As you would expect, there has been a lot of people out there trying to create a real light saber and several people have figured out just how to do it. One company has been pioneering in ultra powerful even visually seen lasers in handheld devices. One such laser is called the Spyder and it's incredibly powerful. The makers of this device have created an "attachment" LaserSaber device that is a long acrylic or glass tube housing the powerful laser. 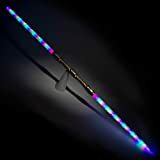 There is much more going on here than simply shining a laser light into a tube, however, this is a gravitational controlled laser light. For more details keep reading! There's even a video to showcase this bad-boy by the company themselves! What Is The Laser Saber? This LaserSaber device is a hybrid of an attachment with long Polycarbonate Blade powered by one of the worlds most powerful lasers. The laser that powers this is the Spyder III Kryptonite (higher powered green laser) or Arctic (high powered blue laser). If the saber were to be swung onto someone it could badly injure or kill them. This is not designed as a toy but rather an appreciation of the technology and for the awesome beauty that is this entire device. Imagine having this on display behind locked glass and when your friends come over you can dramatize it and show them the worlds first real light saber (for legal reasons called "Laser Saber") in all it's glory. It even loads smoothly and crisply as the light builds out to the top of the saber sword piece. The only thing this doesn't have, unfortunately, is the sound effects. 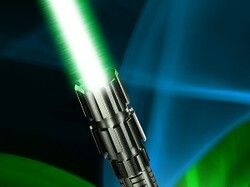 LaserSaber: A real 'Star Wars' lightsaber at last? The Spyder III Pro Arctic is an incredibly powerful laser- one of the most powerful in the world that you can legally own. This laser can put out a pilots eye from 10,000 up in the sky (flying the plane of course) feet from the ground if pointed up at the plane. There is even a warning not to do this very thing (point the laser at planes or helicopters)! Imagine what all that power can do consolidated and compressed into a "saber" blade? You don't have to imagine; wicked lasers did it, and for under 400.00 (299.00 for the Spyder laser device and 100.00 for the LaserSaber attachment piece). The green version is a bit more expensive even though it looks like it's less powerful (from wattage). The reality, however, is that the green laser is incredibly powerful (much more so than the blue laser) and the only one to break the earths atmosphere (from the ground) and push on into space. At close range this laser can cut/melt a CD or even a Velcro strap in seconds. With all this cool laser power out in the open, nobody thought to "cage" it for a more powerful piece of harnessed light. This is precisely what the Laser Saber attachment does. It pushes the light into a diffuser that pushes the laser light up the blade evenly. The laser light inside the sabers blade can inflict some serious damage and even death... So no sword play! This laser, even in sword/saber mode, requires protective eye wear- now that's a powerful light. You can't actually stare into the swords brilliant light with the naked eye unless you want to risk damaging your vision. This device has to be seen only by those with protective eye wear! The light can blind instantly and can set fire to skin so be careful! The unit does come with these glasses. If your planning to showcase your bad boy laser saber make sure you have enough glasses for everyone watching! When Wicked Lasers came out with the Spyder II it was shaped pretty close to the light saber on Star Wars. Lucas tried to sue them even for using the word "Saber" in the name of the new Laser Saber device. The lawsuit failed and Lucas backed off resulting in the Wicked Lasers company pushing forward with their 100.00 laserSaber add on. This attaches to the Spyder series (any of them) and turns a powerful laser into a masterpiece- a laser saber! The blade is 32" and made of polycarbonate (very strong but transparent) long and uses an aircraft-grade aluminum hilt (attachment piece). I really like the part in the pitch for this product where they mention the "ultra-smooth magnetic gravity system that can power up and power down the blade". This is essentially a magnetic ring that controls the laser. When you tilt the sword down this ring slides up to the top and locks in temporarily to hold the laser "on". A bump with the sword and the ring unlocks and falls down slowly giving a powerful "off" effect that looks as smooth and natural as the original movie sabers (Star Wars). It's a pretty amazing effect that you won't find in any light saber "toy". Nothing stays this bright even in direct sunlight, it may not cut someone in half like butter, but it will definitely scare the hell out of someone who didn't know it wasn't a real saber (and impressive too)! It has all the looks and theatrics (in person with no post production added) of the real prop. I think that's enough for most of us who just like the "idea" of the Saber. now you can't buy it (rather get it shipped to you) in the USA... sigh.. I wated years and now I can't have it. MAKE Magazine... Can You Say Geekier and Happier? Find out why MAKE magazine makes even a non-geek drool... It has so many incredible DIY projects that are amazing and amusing. Imagine being able to wear a pair of mock cat ears that actually react to your brainwave patterns. In other words, your emotions and thoughts cause them to react!